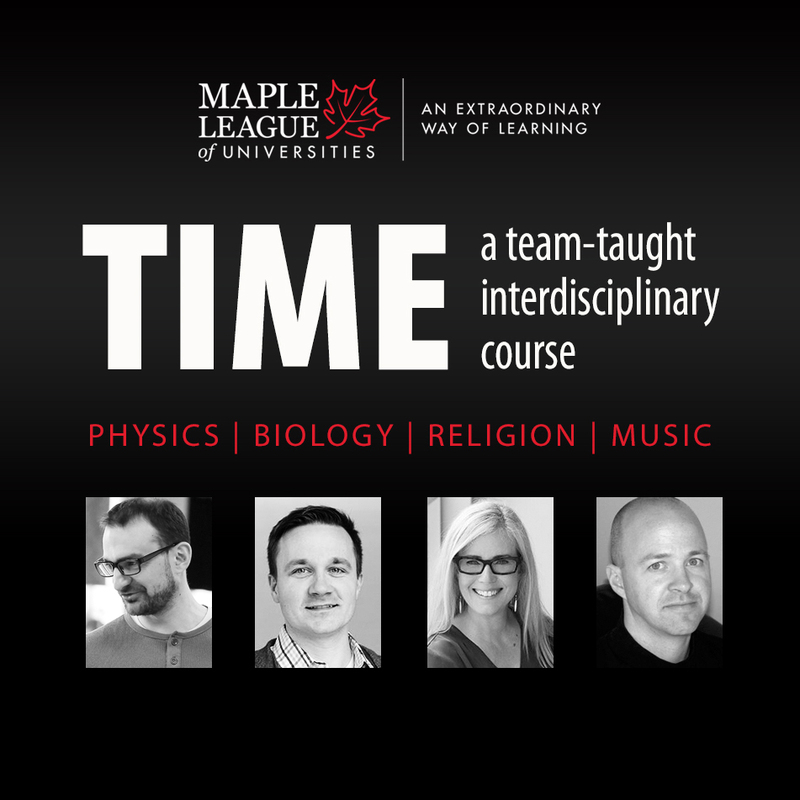 The Maple League universities are offering a new, groundbreaking and multidisciplinary course exploring the theme of “time” this Fall, demonstrating how this consortium of universities can collaborate to offer students a richer, more relevant learning experience across four campuses. Four award-winning professors from different fields (Dr. David Hornidge, Physics, Mount Allison University; Dr. Michele Murray, Religion, Bishop’s University; Dr. Michael Cardinal-Aucoin, Biology, St. Francis Xavier University; and Dr. Jeff Hennesy, Music, Acadia University) have designed an innovative learning experience in a team-taught, distance learning environment. Using the latest technology, students enrolled in the course at all four Maple League universities will reflect on how time informs and shapes knowledge in four very different academic disciplines. They will attend classes via videoconference and in person throughout the Fall semester. Classes are divided into disciplinary blocks and one professor explores what time means in their field of expertise with the students and other instructors. This synchronous online learning experience provides students with both in class and virtual instruction in a small, intimate, seminar-style course. As the professors write, "Time is a concept we encounter every day and yet one that we rarely, if ever, consider beyond checking it on our wall clock (or iPhone). However, our seemingly familiar relationship with time deceives us into believing that the concept of time is a simple one. This course will seek answers to questions such as: What is the meaning of time and how can it be defined? What is the space-time continuum and what does the theory of relativity imply about time? How do organisms perceive time and what is a biological clock? How have different religious traditions perceived time and given it meaning? How is time divided to create rhythms and how do we keep a beat?" Through their collaboration, the four universities of the Maple League help students prepare for rapidly evolving job market, with courses like these that challenge students to think critically and creatively about the world around them.